Free Bumble Bee Tuna Pouch (2.5 oz., select varieties) in Kroger stores, with coupon. 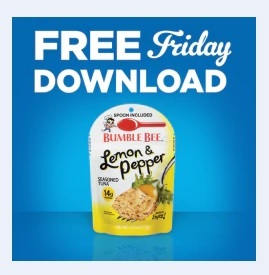 This Kroger Free Friday Coupon is available for download on Friday, October 5, 2018 but you have until October 21, 2018 to redeem it. What is Bumble Bee Tuna Pouch? Bumble Bee Tuna Pouch is perfect for complementing any meal or as a delicious snack on the go. Ingredients: Light Tuna, Water, Salt, Sugar, Black Pepper, Citric Acid, Lemon Juice, Modified Food Starch, Vegetable Broth, Lemon Flavor, Guar Gum. Contains: Fish, Soy. Redeem your coupon in-store within 2 weeks for free Bumble Bee Tuna Pouch (2.5 oz., select varieties). Your coupon will automatically be applied at checkout when you use your Shopper’s Card. Available in most stores.